Pope Francis is officially a rock star. The white duds rockin’ 77 year old had already been named Time’s Person of The Year, but grabbing the cover of Rolling Stone has cemented his status in pop culture. 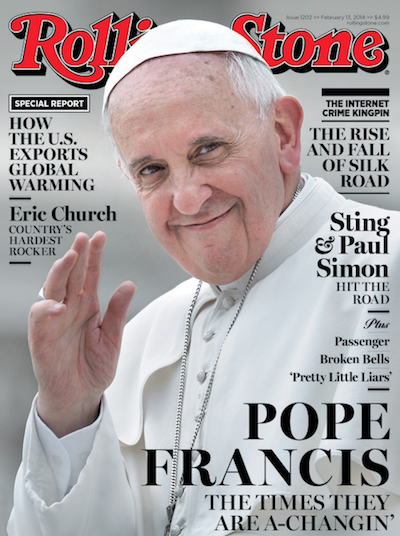 The nearly 8,000 word profile inside Rolling Stone paints the religious leader as “Cool Pope Francis,” playing up the Bob Dylan reference on the cover. Women seeking an abortion might disagree with Francis’ level of coolness, but never mind them. They’re just silly women! Let’s keep our focus on how rad Pope Francis is.